Chase away your family's winter blues with an afternoon at the JC Raulston Arboretum. 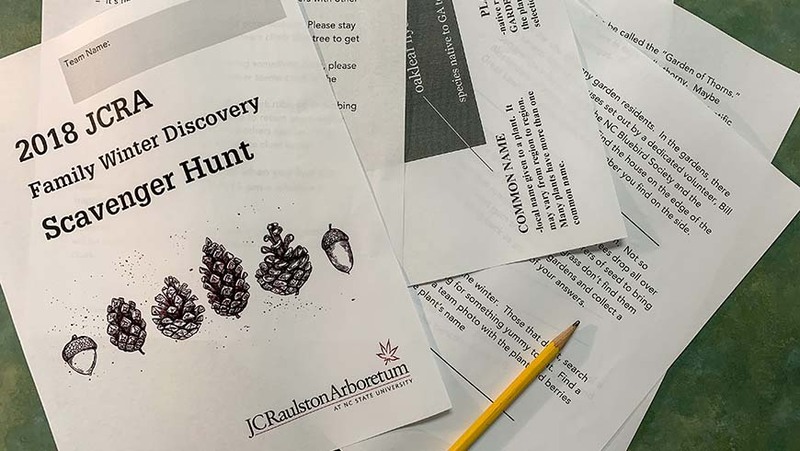 We challenge you to a scavenger hunt in our gardens! Search the gardens for plant names, take pictures of your family at special places in the garden, or count plants, steps, or bricks to answer our tricky questions. Meet us at the Bobby G. Wilder Visitor Center where we will provide you with your team's booklet of adventures that you will need to find as fast as you. The best time makes a difference if we have a tie! Bring a camera to document your finds or we can provide you with a camera if you don't have one. After the hunt, enjoy some fun winter activities in the yurt. Please come dressed for the weather as this program will be primarily outdoors! Groups are welcome to join this activity. Each "family" should consist of at least one adult and no more than 3 adults. Total members of the group should not exceed 7. Suggested for families with children in elementary and middle school. $15.00 for Arboretum member families. $20.00 for nonmember families.